Although we are no longer doing the 5:2 diet I recently made this stew from the BBC Good Food Magazine and think that it would make a perfect evening meal option. 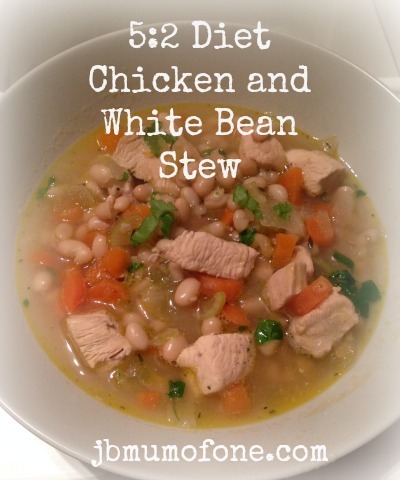 It is healthy, cheap, filling and only 291 calories per serving, (without the bread). It was also really simple to make and even the toddler liked it, despite the vegetables! Heat the oil in a large non-stick pan, add the chicken and fry until lightly browned. Add the vegetables and fry for a few minutes more. Stir in the herbs and stock. Bring to the boil. Stir well then reduce the heat, cover and cook for 40 minutes oruntil the chicken and vegetables are tender. Stir the haricot beans into the pan, then simmer for 5 minutes. Stir in the parsley and serve with crusty bread. This was so easy to make and my toddler loved it. Although not bursting with flavour it was definitely filling and a generous helping of cracked black pepper gave it a good kick. It freezes really well too so great for batch cooking. We will definitely make it again. If you are doing the 5:2 diet do let me know how you are getting on. We stopped as we found we needed extra calories to get through our Insanity fitness programme but am thinking about starting again and would love to hear your progress. This sounds really tasty. I will bookmark it and give it a go. Thanks. Ooh let me know how you get on.